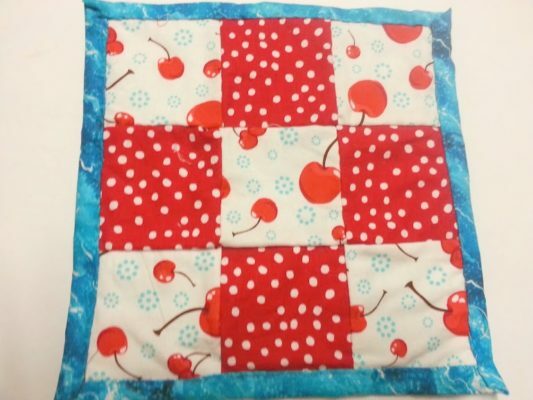 Recently, I made quilted pot holders with my kids at a quilting workshop in the library. As I was sewing with my kids these tiny patches of fabric, I recollected the time my grandmother came to the states to visit us when I was the same age my oldest daughter is now, and the quilt we made together out of old clothes. I didn’t know at that time that these would be my last memories of her. Every time I look at that quilt, I remembered the wonderful memories of us together, creating something beautiful out of nothing. The hours taken from sewing each piece together may seem tedious to some, but it created something more than just a quilt. It created unforgettable memories. The quilt gave us a piece of my grandma who had patiently made with us something that would eventually warm us inside and out. Now that I am older, I had forgotten the art, and alhamdullilah, now that I am reminded again, I want to revive it with my children, inshaAllah. Putting together these tiny pieces of fabric, may seem like a long process, but it allows us to see and appreciate the effort that has been put in it. When you do it together as a family, it creates very special memories that you will treasure for years to come (unless someone loses a finger… just kidding 😉 ). If you are a newbie to quilting, why not spark the interest by starting off with making one of these cute, practical pot holders. 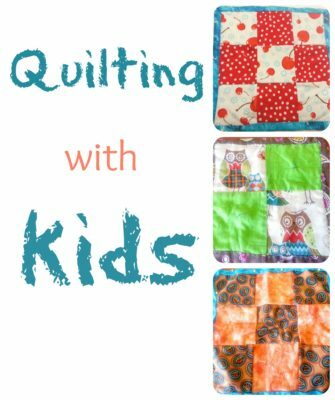 I have 4 kids ages 5-10, and all of them were capable of hand-sewing the squares together, so I can attest that this activity works well for a wide age range. The rest of my children had no problems with sewing the nine piece of quilt. 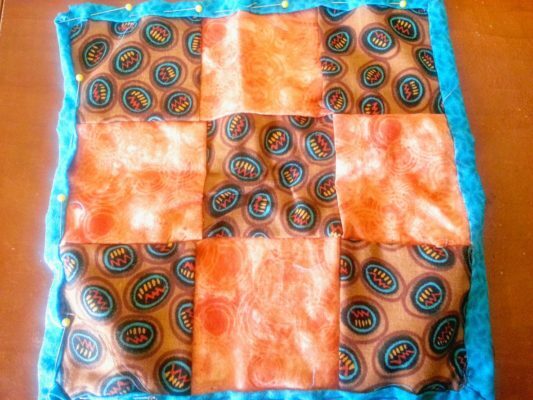 Start by sewing a row of 3 squares together. Once you have 3 rows sewn, sew them together. Center matting on 10 in. square fabric and place quilted pieces on top, centered. Sew the Frame into place.